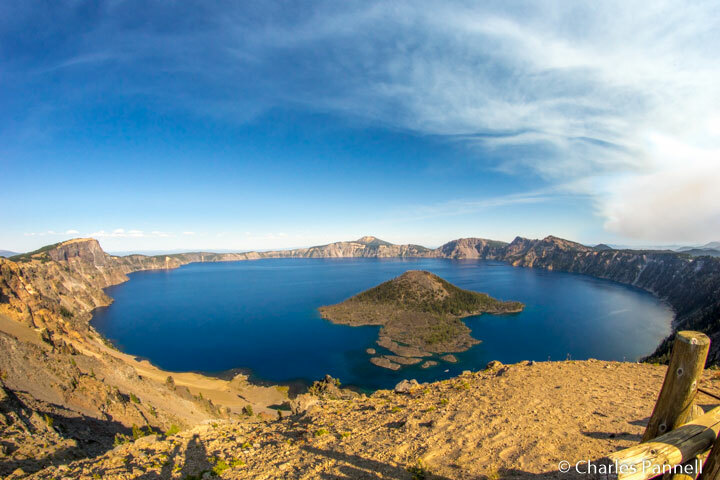 Located at 7,100 feet along Southern Oregon’s Cascade Crest, Crater Lake was created over 7,700 years ago after a massive eruption of Mount Mazama. The resulting caldera filled with melted snow and rainwater, and subsequently the 1943-foot-deep lake took on a deep blue — if not somewhat ethereal — hue. Add in the surrounding cliffs that are nearly 2,000-feet high, two picturesque islands, and an old growth forest and you have all the ingredients for a very scenic national park experience. And although the lake itself isn’t wheelchair-accessible, there are many other areas in Crater Lake National Park (www.nps.gov/crla) that wheelchair-users and slow walkers can enjoy. Although the lake is the crown jewel of the park, the surrounding forest also offers some impressive vistas. To that end, one of the most accessible trails in the park– the Godfrey Glen Trail — is located near the south park entrance, on Munson Valley Road between Mazama Village and Park Headquarters. Some sources rate the trail as “accessible with assistance” while others call it “fully accessible”, but in truth, it’s somewhere in between. There’s accessible parking near the trailhead, with level access over to this 1.1-mile loop trail. The hard-packed dirt trail meanders through an old growth mountain hemlock and Shasta fir forest, and although it’s kept up pretty well, there are still some rocks and ruts along the way. Still, most of the obstacles are easy to dodge, and it’s probably pretty doable in dry weather. There are also benches to sit and take a break along the length of the trail. The real access obstacle comes in the form of a sustained 1:8 grade after you pass the half-way point. It may be doable for people who use power wheelchairs of scooters, but most manual wheelchair-users will need some assistance along the steep stretches. You’ll also get some nice canyon views along the way, but most of the viewpoints are undeveloped, so they won’t work for anybody who uses an assistive device. That said, give it a try as it’s a very scenic trail, but just be mindful of the grade. Additionally it’s best to take the trail in a clockwise direction, as the return trip will be easier if you have to double back. Do as much of the trail as you can, and just enjoy the view. The highlight of any Crater Lake visit is the 31-mile scenic Rim Drive. Although you can drive it straight through in about an hour, allow two-to-three hours, so you can stop at the viewpoints and overlooks along the way. Phantom Ship Overlook is one of the most popular stops, as it offers a good view of a dark jagged island that resembles a ship. There’s no accessible parking, or curb-cut access to the overlook, so if you can’t bump up over the curb you won’t be able to see much from the parking lot. That said, if you can make it over the curb, there’s level access out to the overlook. It’s definitely worth a stop if you can manage it. Just up the road there’s an unmarked overlook between Cloudcap Overlook and Cleetwood Cove that offers a better view. Although there’s still no accessible parking or curb-cut access, you can get a great view from the parking lot. And if you don’t want to get out of your car, you can also get a good windshield view there. Additionally, there are some good windshield views from the road, especially around Cleetwood Cove. For a good view of Wizard island, be sure and stop at Discovery Point. There’s accessible parking, curb-cut access up to the sidewalk, and accessible restrooms at this stop. There are steps up to the upper overlook, but there’s also a ramp at the far end of the parking lot. Even though the ramp is steep — with a grade of 1:8 — some power wheelchair-users may be able to manage the climb. Don’t fret if you can’t make it to the top though, as you’ll catch some of the best views of the island from the road. Once you reach the end of the drive, turn around and take it in the opposite direction. Not only will you get an entirely different view of the lake on the return trip, but you’ll most likely also spot some pullouts that weren’t visible from the other direction. Either way, the Rim Drive is one of the most accessible ways to enjoy Crater Lake National Park.